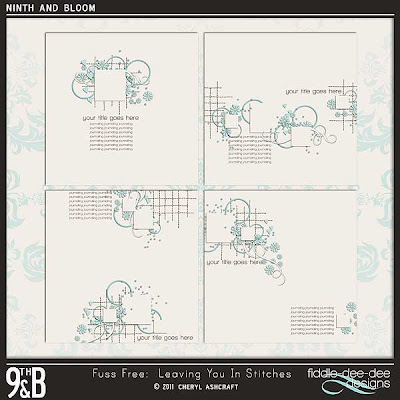 Fiddle-Dee-Dee Designs: Fuss Free: Leaving You In Stitches ~ guesting at 9th and Bloom! Fuss Free: Leaving You In Stitches ~ guesting at 9th and Bloom! Fuss Free: Leaving You In Stitches is a template pack designed to allow stitching to serve as a base for your photo/element clusters. As you can see from the layout examples below, the stitching can be easily replaced with other elements, such as ribbon, string or paper strips. It's available at 9th and Bloom where I'm guesting this month. Image is linked to the 9th and Bloom Shop ~ and the template pack is 20% off for a limited time! Thanks so much for stopping by! Sending you off with wishes for many hours of happy scrapping!